In compliance with the MEPC RESOLUTION 201(62) adopted on 15th July 2011, relating to the International Convention for the Prevention of Pollution from Ships (Annex V MARPOL Convention). On land or at sea acceptance of garbage from ships. This is understood as all kinds of food waste, domestic and operational garbage, all plastics, cargo residues, incinerator ashes, cooking oil, fishing gear and animal carcasses from the ship’s normal operations and that are normally removed continuously or frequently. Operational garbage is understood to be all solid garbage (including mud) not considered in other annexes, which is collected on board during ship maintenance or normal operations or used in loading or handling cargo. As the location is the Mediterranean Sea, a special area due to recognised technical reasons, relating to its oceanographic and ecological conditions and the particular nature of its marine traffic, special mandatory procedures need to be adopted to prevent sea pollution through garbage. That is why it is prohibited to unload food waste into the sea at a distance of less than 12 nautical miles from the coastline. Every ship with a gross tonnage equal to or greater than 400 GT and every ship that is authorised to carry up to 15 people that make trips to ports must have a Garbage Disposal Record Book. 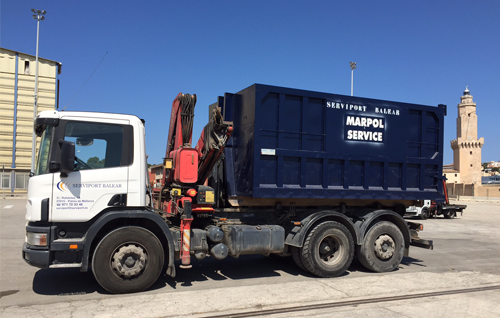 The service must be notified to the company, Serviport Balear, through a waste declaration with at least 24 hours’ notice. On reception at the port (prior to transfer to the treatment centre) they must be categorised and recorded in accordance with current legislation with regards to residues. The waste must be delivered categorised, in appropriate containers and separated. Hazardous operational waste must be separated from the rest of the delivered waste. See identification of hazardous waste accepted for reception. Incinerator ashes (E) must have an analysis and certificate that accredits the lack of toxic or poisonous components. In the absence of said certificate they will be treated as hazardous.